Akropolis Museum The magnificent new museum is at last open. Entrance in Dionysiou Areopagitou Street, a pedestrianised street on the south side of the Akropolis. Opening hours: 8am to 8pm, Fridays 10pm; Tickets cost €5 & €3. The 'short' guide book is €5; last year there was still not a full guide. Large bags must be left in the cloakroom. There is a lift. There is a cafe on the ground floor which we haven't tried, it serves drinks and snacks. 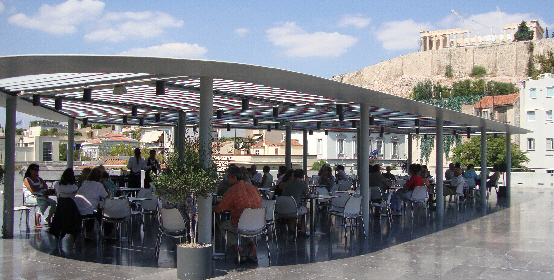 The roof top restaurant (overlooking the Parthenon) does excellent coffee and lunches, but beware, it gets very busy and service is very slow. Photography is not allowed in the museum. The museum building is superb, the setting extraordinary, with views through the huge glass walls across to the Parthenon sitting atop the akropolis. It has been designed to withstand an earthquake of 10 on the Richter scale. As you enter across the forecourt you can look down to see the ancient remains which were discovered during the excavations for the new building. The Parthenon Gallery is on the 3rd floor. The museum was designed specifically to house the marbles from the Parthenon, including those at present in the British Museum, Louvre, Palermo, the Vatican, Würzburg, Vienna, Munich and Copenhagen; of the original 160 metre frieze 50 metres are in Athens and 80 metres in the British Museum. 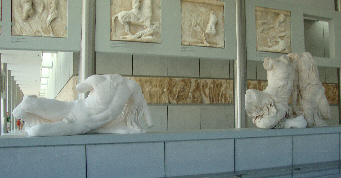 For the first time the marbles are displayed in their entirety; the originals taken down from the Parthenon in the latter half of the 20th century and replicas (which are a rather stark white in comparison to the originals) of those taken by Elgin and others; they are all shown in positions which aim to show how they appeared on the temple, set around a rectangle the same dimensions as and same orientation as the naos of the temple, but at a height which allows you to see them in detail. There are marble benches all around the gallery on which you can rest and contemplate the sculptures. I suggest walking round at least twice, once to get the overall picture and a second time to enjoy them in detail. The sculptures were carved by at least 90 different sculptors. The difference in quality and style suggests they were of a wide age range and skill. You will see how cleverly they are designed to fill the awkward shape of the pediments. The Pediment Sculptures These sculptures were originally only seen from the front and then from about 15 metres above ground, nevertheless the backs of the sculptures are as exquisite as the fronts and luckily for us they are displayed so that we can now see all round them. The sculptures in the west pediment, which would have been seen on approaching the Parthenon, show the contest between Athena and Poseidon. According to the myth Athena and Poseidon met on the Akropolis and challenged each other for the patronage of Athens; Athena struck the ground with her spear and brought forth an olive tree; Poseidon thrust his trident into the ground and caused salt water to flow. The east pediment which was over the sacred entrance to the temple shows the birth of the goddess Athena watched by the other gods and goddesses. There were 95 of these, fourteen on each end of the temple and thirty two on each side, but by no means all them have survived; they were carved in very high relief (protruding up to 25 cm) on slabs just over a metre high with an average width of 1.25 metres; originally they were about 35 cm thick but those in London were reduced in size by Elgin who had the backs hacked off (to make transporting them easier) and are now only 10 cm. They would have been painted and would have had metal attachments. The metopes were carved on the ground and then set in place by sliding them into flanges in the sides of the triglyphs; they were held in place above by the cornice, or geison, so must have been put up before the roof was built. The themes of the sculptures are all taken from myths which would have been very familiar to the Athenians of the mid 5th century, all of them showing the Greeks victorious over their enemies: those from the south side show the Centauromachy (the battle between the centaurs and the Lapiths), the battle of the gods and giants was on the east side, on the west the battle between Greeks and Amazons and on the north, probably the Sack of Troy. The frieze portrays a procession and it is generally believed to be the Panathanaic procession and the presentation of the new peplos to the cult statue of Athena, although there are many elements that do not match that theory. It was certainly the first time a non-mythological subject had been used in the decoration of a temple. The carving in low relief, only six or seven centimetres in depth, is deeper at the top than the bottom so as to lean out slightly. While the carving of the continuous theme must have been carried out by many craftsmen the overall design must have been the work of one artist, possibly Pheidias. Although the frieze is in separate blocks, averaging 1.22 metres in length, the narrative of the sculpture continues without any breaks. Again, the sculptures would have been painted, the background was probably deep blue, men's bodies brown, women's pale, and had metal attachments, you can see the drill holes where the horses' reins were. Taking part in the procession on the frieze are youths and maidens, priests, riders and horses, chariots, and heifers and lambs being led to sacrifice; the frieze depicts 360 human and 250 animal figures in total. On the 1st floor are the Archaic sculptures and sculpture from the Propylaea, Erechtheion and Athena Nike. (after a break for coffee perhaps! the restaurant is on the 2nd floor) Don't miss the Caryatids - For the first time for many years we now see them displayed as they were on the porch of the Erechtheion. Elgin took the second one from the left on the facade, she stands alone in the British Museum, a space awaits her in the Akropolis museum. Here there are excellent models of the south slope of the Akropolis showing the theatres of Dionysos and Herodos Atticus and other models of the Propylaea, Erechtheion and the temple of Athena Nike. The Archaic sculpture and pediment at the top of the stairs. These are from the first temple on the Akropolis, known as the Hekatompedon, built in the 6th century BC (about 570) and burnt down by the Persians in 480. The four horses from a quadriga, or four horse chariot, is also thought to have come from this temple, possibly a metope or a votive relief. . The pediment with the battle of the gods and giants (or Gigantomachy) dates from 525-500 and was on the Archaic temple of Athena Polias (Athena of the City); four figures have survived including Athena (2 m. high) cloaked in her aegis (a snake fringed goat skin) and three giants. The 'olive tree' or Troilus pediment 560-550 BC. This comes from the pediment of a small Archaic building; possibly showing the murder of Troilos, son of Priam, by Achilles, or a cult scene in front of the temple of Athena. The Moschophoros or calf bearer is one of the most beautiful sculptures in the museum, carved in marble from Hymettos around 570-560 BC. He carries a calf wrapped round his neck, its hoofs clutched in both hands, to be sacrificed to Athena. The lamb looks out at us with a trusting look; the bearded man also looks straight ahead, eyes wide open, a slight smile on his lips. There is a sense of calm which belies the purpose of the journey. Kore (head missing) wearing a chiton, peplos and mantle, she holds a wreath in her right hand and a red pomegranate in her left, there are traces of red paint on her mantle, c 580-570; the Peplos Kore, c 530, who wears a very simple straight peplos, holes indicate she had metal earrings. The simplicity of her dress contrasts with the Chiot maiden, c 510, who has a very decorated Ionian peplos which still has traces of blue paint; an unnamed Kore (no 670), 520-510, wearing a loose Ionic chiton, holds her skirt with her left hand, on her wrist is a snake bracelet, and many more ... ! The Kritios boy 480 BC, marks the transition from archaic to classical with the introduction of the bent right knee, and slightly turned head, a significant breakthrough in technique. His hair is bound with a ribbon, suggesting he is a victorious athlete. The Blond Boy, so-called because when he was found there were traces of yellow paint on his hair, also c 480, tilts his head slightly and has a serious expression; his hair is elaborately curled and also tied at the back with a thick plaited ribbon, indicating that he too was an athlete. The 'mourning Athena', in 'severe style', c460 BC, also known as 'contemplative Athena', she wears her plumed helmet and a long belted peplos; her head is bowed and rests on her spear gazing at a stone pillar; it is thought she was contemplating the list of those who died at the battle of Marathon. The winged Nike from the parapet of the Athene Nike temple is shown adjusting her sandal, probably removing it in order to enter the temple. She is stunning - have you noticed that her beautifully draped chiton, which appears to be almost transparent and clings to her breast, has slipped and exposed not only her shoulder but her bare stomach! There are some superbly sculpted animals here too. The front of a horse, 490-480, a dedication to Athena, with ears pricked, nostrils flared and mouth open, its right hoof pawing the ground, it is full of nervous energy. The bust of Alexander as a youth, possibly by Leochares or Lysippos 336 BC.